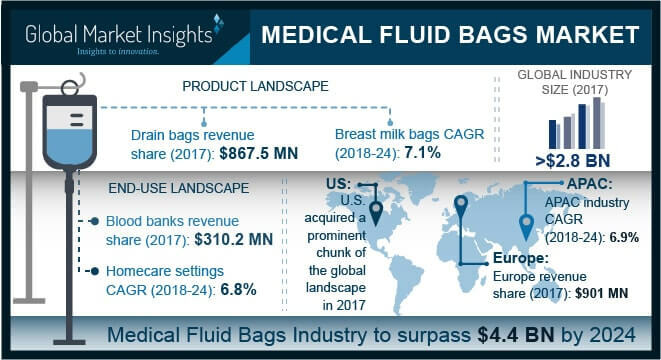 Medical Fluid Bags Market size is set to exceed USD 4.4 billion by 2024; according to a new research report by Global Market Insights. Growing geriatric population across the globe will drive the demand for medical fluid bags market during the forecast period. According to United Nations, the geriatric population accounted for 962 million in 2017 and is expected to double to reach nearly 2.1 billion by 2050. Increase in age results in loss of appetite as well as motor skills that are required for eating. Need for parenteral nutrition through use of IV is high among the elderly patients owing to inability or difficulty in swallowing. Furthermore, bowel and urine incontinence among the geriatric population will fuel the demand for drainage bags during the forthcoming years.